Bulwell (Nottinghamshire) (BA Collieries Ltd) the smallest of the Leen Valley collieries, sunk in 1868/72 by Chas Seely and Co was closed in Oct 1944 after 76 years, Main Bright 3’ 0” (0.91m), at 182 yards (166m), Top Hard pit bottom 307 yards (280m), 371 u/g/116 s/f in 1940 and was called ‘Shonky pit’, at 10 ft (3.05m) dia was sunk to a total depth of 315 yards (288m). 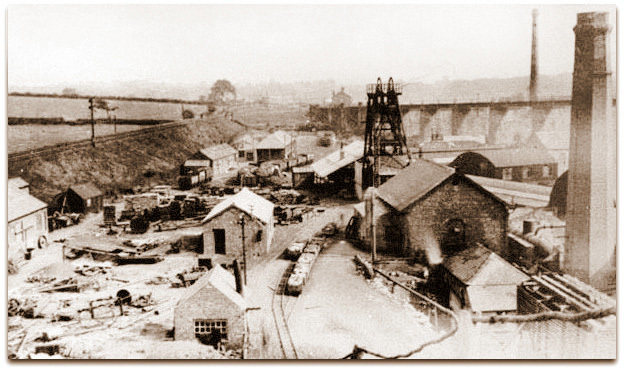 BA Collieries Ltd 1936-1945. E453060 N345900. Top Hard 1872-1911 at 6ft 6½ in (1.99m) thick finished in March 1911. The 3 ft thick (0.91m) Main Bright also known as the Bulwell Main at 182 yards (166m) finished coaling in August 1944. The pit was abandoned in 1945. 1945: 18 MB, 11s/f, abandoned 9/45. Major FMT Bunney (2760) 1944-1945. SE Marston (3372 / 2nd) 1944-1945. 1 Aug 1917 Art Woodward (32), dataller, fall injured spine, died later. Notes were made in the statistics from 1935 as to whether a person was wearing a helmet or not, on one occasion a statement said that one man’s life was definitely saved because he was wearing one. Dr Duncan was certifying men fit for work at the time for the company and another of his reports stated that a man was not suffering from a back injury caused by an accident, but suffering from lumbago! Surveyor: Lewis H Spencer (517), Chief Surveyor to BA Collieries Ltd.
Denby Clay No2 (WH and J Slater), Denby, Blackshale, discontinued June. Holbrook No2 and 3 and Norwood (J and G Wells Ltd), Eckington, Deep Soft or Flockton, Feb 1944, joined to Westthorpe, Harold Cox (1598), G Walker (3903). Chimney and winding house demolished. At one period there were coke ovens and a wooden cooling tower for steam winding. Holbrook Parkgate finished 31 Mar 1931, plan by Harold Cox (1598) 10 Oct 1944, G Walker (3903). New Horsley (New Horsley Kilburn Colliery Co Ltd, Messrs Pickbourne and Hawkins), uneconomic generally and loss of money due to underground fire, Kilburn 4’ 3” (1.30m) and 1’ 0” (0.30m) floor coal, May 1944. Shireoaks No3 (Shireoaks Colliery Co Ltd), Harricroft, 1/1, discontinued since Aug 1929. Wheeldon Mill No2 (JS Gaunt), Brimington, sinking abandoned Jan 1944. Wingerworth (A Hardy) one adit from outcrop, worked through old hollows but met other old works coal Deep Hard, or Parkgate? - section: coal 3’ 2” (0.96m), dirt 5” (0.12m), coal 2’ 3” (0.69m), 30 Sep 1944, uneconomic, Surveyor: William M Erskine (1518) Mar 1943. Yew Tree (Refractory Minerals Ltd), Wessington, (Derbyshire) Alton, Thin or Halifax Hard 1’ 2” (0.47m) and 5’ 6” (1.68m) ganister, 7/1, full dip 1in6.5, started 1937, abandoned 30 Sep 1944, Surveyor William M Erskine (1518). 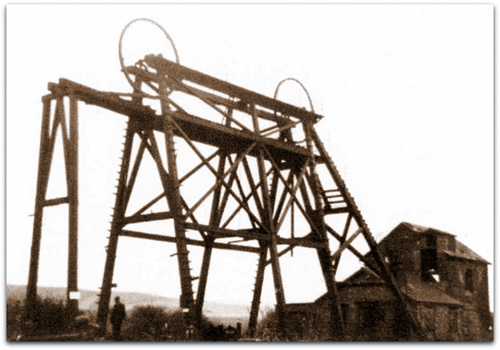 For some reason at most collieries around this time the name Tupton was changed to Low Main. Francis Thompson’s Atmospheric pumping engine of 1791 was re-erected at the pit and was in use until 1918. Pentrich (Derbyshire) (Pentrich Colliery Co Ltd), Pentrich, finished production on 14th July 1944 and was closed November 1944. Shaft positions SK E439410, N361800, E439450, N361800 and E439380, N351830. Agents: RH Swallow (2557) 1940-1944. M McPherson (5551 / 2nd) 1944. Tom M Neal - 19 December 1910 (age?) 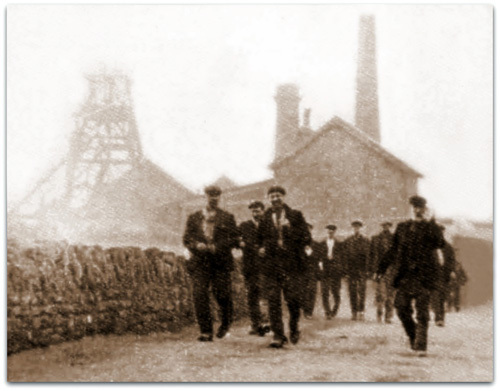 Tom was injured at Pentrich Colliery. After treatment he was transported to Derby hospital where he died from his injury as the bumpy journey by horse drawn cart had opened his wound and despite all efforts to stop the bleeding he became too weak to be treated. The Top Hard at Langwith (Derbyshire) was exhausted. 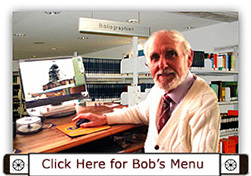 Surveyor, Stan Coe (973) – later a Sub Area Surveyor, No1 Area NCB. Shirebrook, George Henry Pears (35) caught in a cutter 27 Jul 1944. Leicestershire 27s 0½d (£1.35) per shift. Leicestershire 13 pits with 144 machines producing 4.38m tons. There were still 40,000 pit ponies employed at the mines throughout the country.